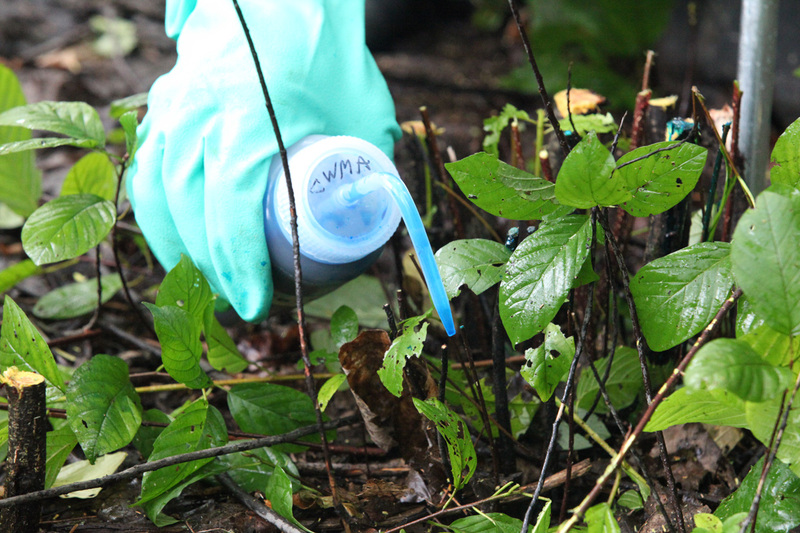 Chemicals are but one tool out of many for invasive plant removal. The decision to use herbicides, including when, what, and how, must be made within the context of an overall management plan for a site. 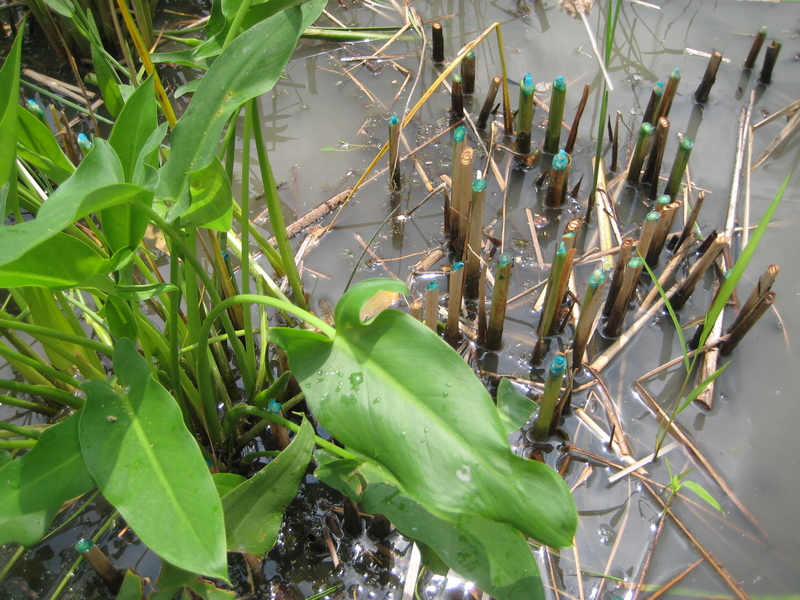 It is useful to think of herbicides as a strong medicine for an afflicted ecosystem. Killing invasive plants with herbicide could take care of a problem, or it could lead to further disturbance and new invasions. 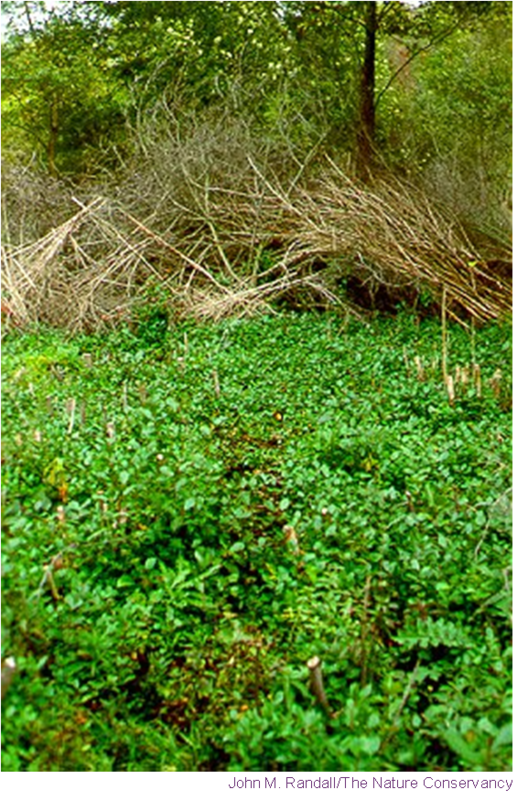 Chemical control methods are most reliable for combating invasive plants, as systemic herbicides are designed to kill the entire plant, above and below ground. There are no simple prescriptions for how to use herbicides in natural areas: much depends on the site and the season. 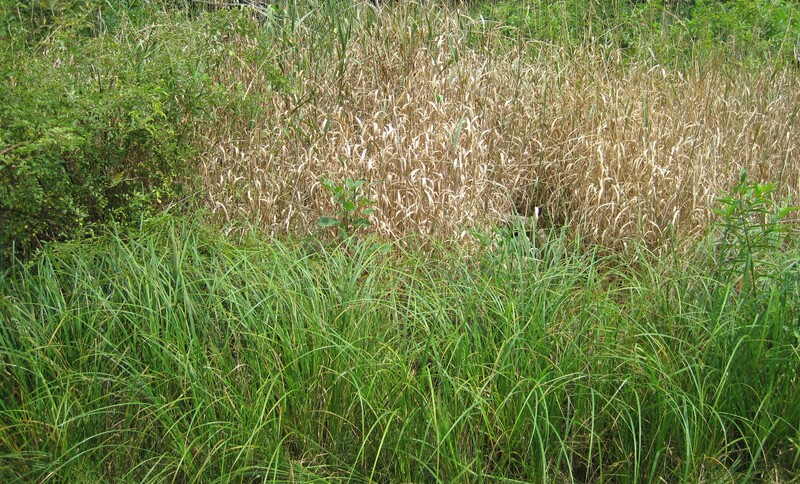 Chemical control techniques can be used when invasive plants are too thick or too widespread for effective control by mechanical methods. Used on: Herbaceous or woody plants that are in full leaf and actively growing.Herbicide is applied to the leaves of invasive plants, either by using a backpack sprayer, aircraft, or vehicle mounted sprayer. Seasons: During the growing season, generally recommended for mid-season when the target species have maximized their root reserves and resources. For annuals, treat at or before flowering to prevent seed set. For perennials, treat at or before flowering, or in late fall during the time of carbohydrate sequestration (for winter-dormant plants). Site conditions: Vegetation must be dry; easiest to use for vegetation that is less than 2 meters tall. Large monospecific stands of invasive plants are suited for foliar spray, because there is minimal risk of overspray onto desirable plants. How to use: Herbicides for foliar spray are typically diluted to 0.5% to 1.5% by volume. Lower concentrations are used for high-volume sprays (such as mechanized spray). Higher concentrations are used for low-volume, spot spray from backpacks. Foliar spray typically involves a blue tracking dye to identify which plants have been treated. Follow the label recommendations for the concentration of dye to use. Blue dye is commonly used – it becomes less noticeable when it dries. A truck-mounted sprayer with a long hose makes short work of invasive cattails. A phragmites-infested marsh is treated from an amphibious all-terrain vehicle. For situations where invasive plants are more spread out or patchy, backpack sprayers can be more precise, reducing chances for overspray onto desirable plants. Sprayers should be equipped with adjustable nozzles, allowing for variations in spray width. When working close to the target plants, the most effective method is setting the adjustment to a fine spray, as the small droplets of spray are more easily taken up by the leaves, and spray is less likely to be wasted when dripping off leaves. Be aware that the smaller the droplet, the higher the potential for spray drift. For reaching targets from a greater distance, a narrow stream can be used, though it is less accurate. Used on: Woody plants (shrubs and trees); can be used at lower concentrations on fleshy, thick herbs like cattails; may or may not be effective on woody vines or small diameter shrubs like common privet. Buckthorn stems are cut close to the ground and treated immediately with herbicide. Marker dye added to the herbicide solution makes it easier to track which stems have been treated. Glossy buckthorn was cut in the winter and allowed to resprout. The following year, the stump sprouts were treated with foliar spray. Seasons: Mid-growing season through early winter (less effective in late winter or early spring when sap is rising). Site conditions: This method is applied when target species need to be physically removed from site (compare to basal bark treatment). 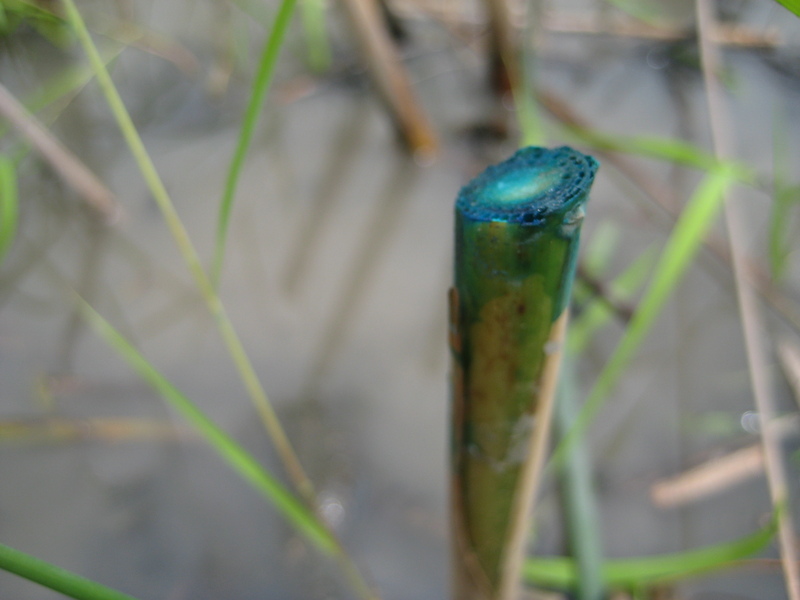 It can be used in wetlands or sensitive areas. Sometimes trees and shrubs are too large to be effectively treated with foliar spray, or the invasive plants are too sparse to justify spraying. How to use: The cut-stump technique employs hand saws, pruners, chainsaws, or brushcutters to cut through trees or woody shrubs, leaving a stump a few inches above the ground. Cut surfaces should be horizontal (relative to the pull of gravity) so the herbicide will stay on the stump after application. Concentrated herbicide, diluted to 20-50% by volume with water, is delivered by squirt bottle in a ring covering the exposed vascular tissue. Here the herbicide will be transported by the plant down to the root system where it will completely kill the plant. 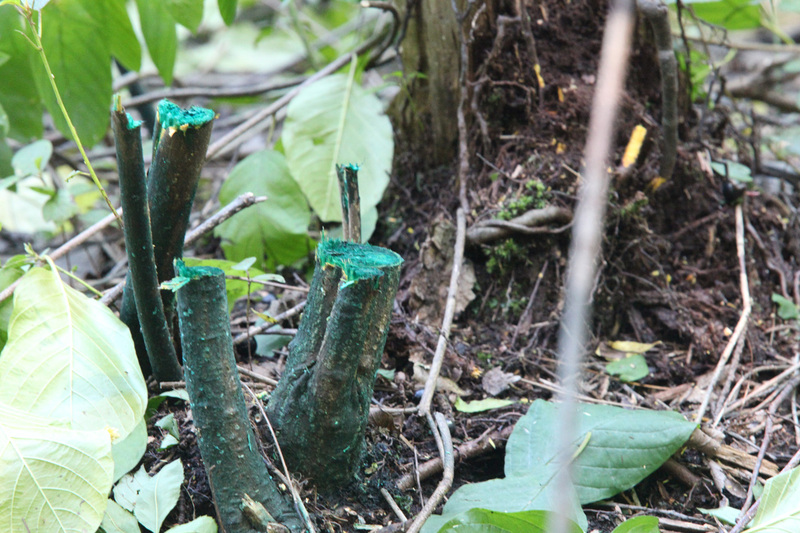 The herbicide must be applied to a freshly-cut stump (within 5 to 15 minutes of cutting), while the plant is reacting to the injury. Re-cutting and treating the stumps later will not produce the desired effect. 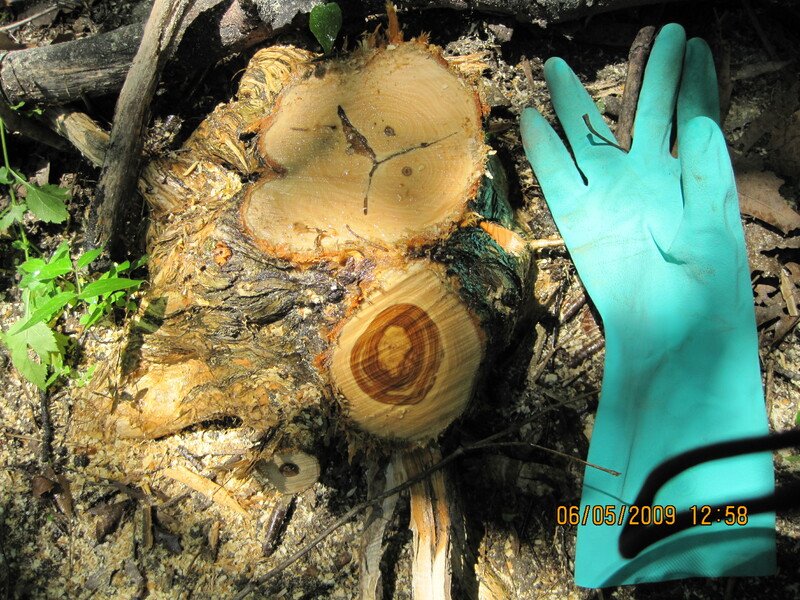 On large diameter stumps, apply herbicide to the ring of vascular tissue between the heartwood or pith of the stump and the bark, where it will be absorbed and translocated. 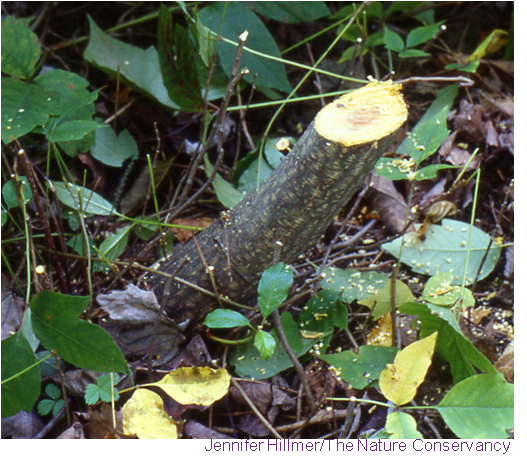 On small stumps, the entire cut surface is treated (this is a matter of stem diameter, not biology). Used on: Thin-barked shrubs or trees in a band from the root crown up the stem, encircling the stem. Seasons: Anytime except when temperature exceeds about 80 degrees F, to avoid volatilization of the herbicide. Site conditions: Use where leaf brownout or standing dead vegetation will not be a problem, but do not use when bark is wet or precipitation is forecast. Generally not for wetland use. How to use: Herbicide is applied in a band around the bark, starting at the root crown at ground level. Herbicide is mixed with a carrier oil, which allows the herbicide to penetrate the bark and reach the cambium (growth tissue).